The Pittsburgh Penguins have re-signed forward Bobby Farnham to a one-year contract, it was announced today by executive vice president and general manager Jim Rutherford. The deal is a two-way contract and has an average annual value of $550,000 at the NHL level. 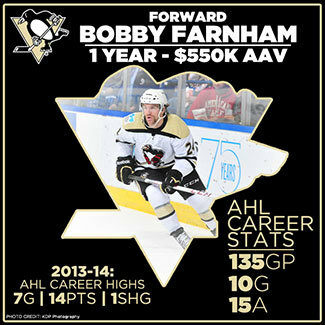 Farnham, 25, played his first full season in the American Hockey League with the Wilkes-Barre/Scranton Penguins in 2013-14, notching seven goals, seven assists, 14 points and 166 penalty minutes in 64 regular-season games. He also suited up for all 12 playoff games. The 5-foot-10, 188-pound Farnham has played the past two seasons with WBS, totaling 25 points (10G-15A) and 440 penalty minutes in 129 regular-season games. Farnham has also played in 18 postseason contests with WBS during that span. A native of North Andover, Massachusetts, Farnham made his professional debut at the tail end of the 2011-12 campaign, suiting up for a total of six games with the Providence Bruins and Worcester Sharks of the AHL. Farnham has also skated for the Wheeling Nailers of the ECHL. Farnham played four seasons of college hockey at Brown University from 2008-12, improving his offensive numbers each year. During his senior season in ’11-12, Farnham established career highs in goals (t-8), assists (13) and points (21) in 31 games played. Farnham finished his career with 54 points (23G-31A) and 128 penalty minutes in 129 games. An alternate captain during his senior year, Farnham won the New England Unsung Hero Award in ’11-12 and he was named to the ECAC All-Academic Team in ’08-09.